In Pikmin 2, a Fiery Blowhog requires the strength of seven Pikmin to lift it. Here, there are eight Yellow Pikmin carrying it. In the Pikmin games, Pikmin are able to carry objects or living beings towards a destination. When ordered to handle with an object that can be carried, a Pikmin will grab on to it. Further Pikmin can be issued to carry the same thing, at which point they'll grab a free spot on the object's perimeter to help carry. If it's too heavy, the Pikmin will just stand in place, periodically trying to pull it up, but once enough Pikmin grab onto the object, they will be able to carry it away. While an object is being carried, idle Pikmin nearby will attempt to help the carriers, if there is enough space around the object. If there is enough space for the new Pikmin, it will attempt to go the spot, and when it gets close, it will join them and the overall carrying speed will change accordingly. In the first two games, the carriers briefly halt in order for the new Pikmin to join them, but in Pikmin 3, adding and subtracting Pikmin fluently changes the carrying velocity. If a Pikmin cannot join carrying for a few seconds, it will sigh and become idle. If there are no free spots to begin with, the Pikmin will just remain idle, or attempt to work on a different task. When called, the Pikmin will let go of the object and come to the leader's side. If only some of the Pikmin are called, and the remaining Pikmin aren't enough to carry the object, they'll drop it and return to struggling to pick it up. Members of the scarpanid family can carry different objects, including Pikmin, leaders, and sparklium. Members of the dweevil family can carry the same things that require multiple Pikmin to carry. Careening Dirigibugs can carry and throw the bomb rocks they create. Honeywisps can carry eggs, which they release upon defeat. Leaders can carry Pikmin (when they hold them before throwing them), and on Hostile Territory, bomb rocks. Skutterchucks can carry, toss, and drop crystal nodules. Some jellyfloat family and umbloda family members can carry Pikmin or leaders inside of them. In the first two games, the Pikmin gather around the object as if its perimeter is always a circle. Most objects have a circular radius, but for some objects that do not, such as the Love Tester, some Pikmin will be seen clearly holding on to nothing. In the third Pikmin game, this aspect was polished, and all carrier Pikmin now grab on to the object. Depending on what is being carried, the Pikmin can either take it to the ship (or Pod) or an Onion. The Pikmin will follow one of several set paths – normally the shortest, unless it's unavailable – toward the destination. If the only path is blocked by a gate or a gap with a missing bridge, the Pikmin will start walking in a circle in front of the obstacle, waiting for it to be cleared. Interestingly, this also happens if a non-Winged Pikmin tries to take a pink pellet away from the Winged Onion's base, possibly as a way to prevent the player from getting rid of a helpful Winged Pikmin growing tool. Any Pikmin will be able to carry the pellet like normal after the Winged Onion merges with the Master Onion, however. When carrying objects that will be deposited in an Onion, the destination Onion is calculated based on the Pikmin carrying it. The Onion will match the type of the Pikmin type that makes up the majority of the carriers. If the number is a tie, the type will be decided randomly between the tying types. White Pikmin and Purple Pikmin don't count for the calculation. As such, only the other Pikmin types can have an influence on the chosen Onion. If only White or Purple Pikmin are carrying it, a random Onion will be chosen (out of all Onions available at that point). When a random Onion needs to be picked, it'll be decided every time a tie is generated. In other words, if a tie-breaking Pikmin is added, the type will be the one matching the new majority. If a Pikmin that doesn't break the tie is added, the destination will not change. Hence, the only way to change the type the game picked is by breaking a tie and then creating a new one, or by calling all Pikmin to the leader's side and ordering them to carry it again, which is the same thing. Despite Pikmin 3 having only a single Onion, the same rules apply, except the "chosen Onion" just means the Pikmin type of the seeds that come out. The first columns indicate the number of Pikmin of each type that is carrying the object. To do: Figure out if these objects have a different carrying speed. Starting in Pikmin 2, some objects have a maximum number of carriers of 1. The carrying numbers don't appear above these items in Pikmin 2 (contrast '1' pellets), and as such only one Pikmin may carry these items at a time. Items that come from a pile in Pikmin 3 also lack numbers, due to the different way in which they are carried. Members of the Mandiblard family. Skitter Leaves and Desiccated Skitter Leaves. Cupid's Grenades, but only in 2-Player Battle. Berries from Burgeoning Spiderwort plants. Individual grapes from Dawn Pustules and Dusk Pustules. In Pikmin 3, Pikmin carrying Burgeoning Spiderwort berries or treasures and objects that are a part of a pile follow some more specific behaviors. The object will vanish if the Pikmin carrying them is whistled, and if it belonged to a pile, it will then reappear there. Pikmin carrying these objects will complain with a brief squeal if a leader crosses their way. The current leader can also push them by bumping into them, which can be used to make them go faster. Finally, after they deliver the object, they will automatically return to the pile's original location to work on another object of the pile, and if the entire task has been done, they will go there to idle instead. Although they don't carry them in the normal sense, Pikmin also carry bomb rocks and Bingo Battle mines by themselves. Instead of taking a linear path on their own and dropping the items on a destination, the Pikmin act like regular Pikmin, except they have an explosive in their hands, ready to be used, and will not attack enemies or obstacles with melee attacks. 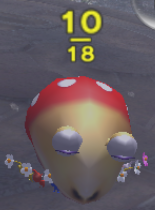 Example of the carrying numbers displayed on the HUD, in Pikmin 2. Each object has a weight and maximum number of carrier Pikmin. If the combined strength of the Pikmin is less than the weight, it cannot be carried. If the maximum number of carriers is already met, any new Pikmin will ignore the object. The "strength" is the total calculated Pikmin strength, so Purple Pikmin count 10 towards this number, instead of 1 like all others. For the minimum strength and maximum number of carriers on a ship part, treasure, enemy or fruit, please visit the appropriate page and read the "Weight" and "Max. carriers" attributes on the infobox at the top-right corner of the article. When something is being carried, two numbers will appear on top of it, which indicate the strength of the carriers and the object's weight. These numbers will only appear on the HUD if the object has any carrier Pikmin on it. In Pikmin and Pikmin 2, the number of Pikmin needed to carry the object will be on the top, while the number of Pikmin carrying the object will be below it. This was reversed in Pikmin 3, likely to make more sense as a fraction. More information can be found here. In Pikmin 3, if an object is being carried by Winged Pikmin, it will be transported in the air. Any regular object in the game has spots where the Pikmin can grab, and these spots come in two rows: one at ground level, for grounded Pikmin, and one a bit higher, for Winged Pikmin. Both rows have the same number of spots. This means Winged Pikmin can carry an object alongside grounded Pikmin, but if they have enough strength to lift the object by themselves, they will do it. Should this happen while grounded Pikmin are carrying, they will let go and sigh. If a grounded Pikmin joins in to help the moment the object starts to lift-off, those grounded Pikmin will latch on, be lifted, and remained grabbed onto it in mid-air for some seconds, before eventually letting go and falling to the ground. This can be seen easily by dismissing a varied group of Winged and grounded Pikmin onto an object. For a practical example, while carrying a Spotty Bulbear's carcass (12 Pikmin needed to start moving, 25 maximum carrying spots), 25 grounded Pikmin may carry it alongside 11 Winged Pikmin. If a 12th Winged Pikmin is added, the Winged Pikmin will begin carrying the corpse in mid-air, and soon after, the grounded Pikmin will let go. That said, if Winged Pikmin take flight and grounded Pikmin stay latched on, those Pikmin will also count as carrying the object, until the moment they let go. This has an impact on the speed at which the object moves, in that the object is carried more quickly when there are grounded Pikmin still clinging on, and becomes slower when those Pikmin detach. So, for this scenario, the "real" maximum number of carriers can actually be considered the "regular" maximum times two (e.g. 10 grounded Pikmin clinging on + 10 Winged Pikmin lifting the object). If Winged Pikmin are carrying something through the air and the player orders grounded Pikmin to help carry it (via charge or throw), most of the Pikmin will get close and become idle, although some might actually jump and cling on to the object, only to let go after a second. To do: Check, for each game, what happens if non-Blue Pikmin decide to take a path that has water in the way. The game calculates which path the Pikmin should take by examining all possible paths that reach the destination, and discarding those that are blocked. A path is considered blocked if a bridge within is unbuilt, if an uncleared gate is in the way, or if any other obstacle is blocking the path. In the case of multiple possible paths, the shortest one is picked. If the only available path is blocked, the Pikmin will follow it as far as they can, until they reach the obstacle, where they will move around in a small circle, waiting for it to be cleared. The paths in-game are consisted of interconnected waypoints forming a graph. These points are not visible to the player, nor are the paths in-between. Whenever the Pikmin begin carrying an object, they move to the nearest waypoint on the map. Once there, they follow the calculated path, walking in a straight line from waypoint to waypoint, until they reach their destination. Should the closest waypoint be on the other side of the wall, the Pikmin will attempt to go for it regardless. This can lead to them getting stuck behind the wall; see oversights. Once Pikmin begin carrying they choose a path, no matter how long. Opening up a shortcut during their carrying will not change their minds, unless the load is dropped and picked up again, or unless (in the first two games) Pikmin carriers are added and the total speed is "updated." In Pikmin 3, if only Blue Pikmin are carrying an object on a path that has crossed or will cross water, only Blue or Winged Pikmin can join them. This limit is to prevent Pikmin drowning through that path, but it can decrease efficiency if Blue Pikmin are scarce. It helps to call back blue carriers and replace them with other types once an object's path is free of water obstacles. Inside a cave in Pikmin 2, if the player has not explored a given path, the Pikmin will not go through it when carrying things back to the Research Pod. The following are charts of the paths in the Pikmin games, generated using information from the game's files. Waypoints have a radius attribute, which is represented on the charts, but their function is currently unknown. These charts were also aligned manually, so they're expected to have a very slight error in positioning. Also to note is that the radar patterns don't reflect the terrain exactly, so some nodes that may look like they're on top of one ledge could actually be on the ground below, for instance. Please click on the images to see a higher resolution version, but be warned that the full images are very large. In general, the carrier Pikmin's maturity, whether they are spicy or not, the number of carriers, and the type of the Pikmin all have an impact on how quickly the object is carried. The speed at which Pikmin carry an object in Pikmin depends on the carrier Pikmin's maturity and total amount, and the object's weight and maximum number of carriers. Fan-driven research has resulted in the following formula for the speed at which Pikmin carry an object, where w is the object's weight, m is the object's maximum carrier number, and P is the set of all carrier Pikmin. Sp refers to the stage of any given carrier Pikmin. The final number is in an arbitrary unit of speed. The speed at which an object is carried depends on several factors, like the type, maturity, and spicy status of the carrier Pikmin, the total amount of carriers, the maximum amount of carriers for that object, the object's weight, and some other internal values. Fan-driven research has resulted in the following formula for carrying speeds, where w is the object's weight, m is the object's maximum carrier number, and P is the set of all carrier Pikmin. Tp refers to any given carrier Pikmin's type, and Sp to its stage. The final number is in an arbitrary unit of speed. For the Doomsday Apparatus, the weight and minimum carriers are both set to 1'000. Whenever a carrier Pikmin is added to the object, a variable related to the object's carry speed is increased, and when a carrier is removed, the value is decreased. Every Pikmin type, maturity, and spicy status results in a different change in value. Because the game only updates the value based on Pikmin added and removed, a glitch can occur: if a Pikmin changes maturity or status while it is holding on to the object, then whistling it back can result in the value being mismatched, and keeping some leftover speed. One practical way to do this is to add a spicy leaf Pikmin to the object (which increases the value a lot), let the spray run out, and then whistle it back (which decreases the value slightly). This will keep some leftover speed in the object forever, which can be stacked to raise its speed overall. This also means that Pikmin that were under the effects of the ultra-spicy spray when they started carrying will continue to carry at the spray's speed if it runs out mid-trip. The only other ways to change a Pikmin's value mid-carry is to flower them with the appropriate item in 2-Player Battle or to get them withered by a Withering Blowhog (which works regardless of them being Purple Pikmin or not). 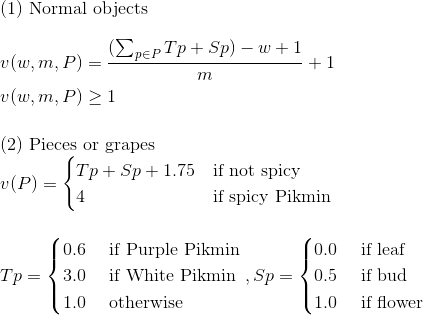 Based on RAM readings, the value each Pikmin contributes depends on the table specified in the formula above, and ultra-spicy spray makes the Pikmin count as a flower Pikmin in terms of carrying speed. This also means that using an ultra-spicy spray on a group of flower Pikmin has absolutely no effect on their carrying speed. Interestingly, any Pikmin carrying a leader will move at the fastest carrying speed possible, regardless of how many are carrying, their type, maturity, or whether they're spicy or not. 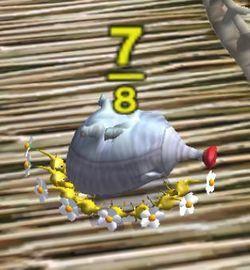 Much like in Pikmin 2, the carrying speed depends on the type, maturity, spicy status, and total of carrier Pikmin, as well as the object's weight and maximum amount of carriers. Fan-driven research has resulted in the following formula for carrying speeds, where w is the object's weight, m is the object's maximum carrier number, and P is the set of all carrier Pikmin. Tp refers to any given carrier Pikmin's type, and Sp to its stage. The final number is in an arbitrary unit of speed. Because of the values used by Pikmin 3, it is possible for the formula to return a number smaller than 1, but in such cases, the game just clamps the value to 1, to stop Pikmin from carrying things too slowly. While it is not known how much, Winged Pikmin carrying an object through the air travel at a slower pace than grounded Pikmin do. The carrying complications regarding Winged Pikmin also impact speed. If grounded Pikmin are carrying an object, adding Winged Pikmin to the object will not increase its carrying speed. However, if there are not enough grounded Pikmin to carry, Winged Pikmin will add speed at the same rate as a grounded Pikmin. As mentioned above, this formula applies even as an object is being lifted into the air and grounded Pikmin are clinging on to it. Suggestions: Get more generic strategies, like finding out the best option between having several, weak Pikmin carry something, or few, strong and slow Pikmin, and other stuff like that. To save time, you can whistle Pikmin carrying a ship part, treasure or fruit when they're almost done delivering, and you have other Pikmin that are carrying something on their way to the same ship. The Pikmin you whistle will let go off the object and come to you, and when the next group of Pikmin come, they will deliver their object, stay idle, notice the nearby object, and carry that as well. This depends on the number of Pikmin carrying the first and second object, as well as its radius, and how far away the first object is from the second group of Pikmin when they deliver their item. It is a weak strategy, one that saves no more than a few seconds, but of relative importance for speedruns. When Pikmin are carrying some objects down a ledge, it may be faster to whistle them when the object is on the edge, so that they let go, and make it fall down and slide forward rapidly. This only applies to a few edges (e.g. the edge with the 5-pellet Pellet Posy at the landing site of the Valley of Repose). In Pikmin 2, because Pikmin keep their spicy speed until they release the object, even if the spray's effects run out in the meantime, this can be used to speed up Pikmin during long treks. In Pikmin 3, one can push a Pikmin that is carrying a small object in order to speed it up slightly. This can be achieved by bumping into the Pikmin with the current leader. In some places, Pikmin can carry lying leaders up walls. This happens if the closest waypoint is on the other side of a slanted wall. Normally, it's possible to regain control of the leader and stand on top of the climbed surface, which can allow the player to go out-of-bounds or skip obstacles. Some oversights also exist in the form of missing or incorrect waypoints, most of them for paths under bridges. Instead of moving out from under the bridge, the Pikmin walk into the bottom of the bridge and become stuck. On top of path oversights, there is also the fact that in Pikmin 2, Pikmin in the spicy status prior to carrying will keep their speed even after the effects wear off, until they let go off the object. Although canonically, only two Pikmin can carry a 1 pellet, there is some mystery surrounding the possibility of three Pikmin doing so. Particularly: Explain in detail the mechanic in which Pikmin drop the object if Olimar goes into a different part of the area. In Hey! Pikmin, only the number of Pikmin required to lift an object can carry it, and they move at a fixed speed, slower than their walking speed. Pikmin can also carry smaller objects like Sparklium Seeds, hearts, and bomb rocks, on their own at their normal speed. Once Pikmin start carrying a large object, they move horizontally in the direction Olimar is at the time, and will not stop until they find Olimar or an obstacle, at which point they'll turn around. If the Pikmin would fall down a ledge when carrying something large, they will drop it for a second, pick it back up, and once again start carrying it in the direction Olimar is at that time. Blue Pikmin can carry treasures under water, and will do so vertically and horizontally, prioritizing vertically following in what direction Olimar is in. Pikmin are not able to be called back when all of the number of Pikmin required to carry the treasure has been reached, and will not start carrying a treasure if they walk past one when being called by the whistle. They can be called back if they are holding on to an object, but are unable to lift it, or have not finished their "picking up" animation. Purple and White Pikmin change in size while carrying. In Pikmin 2 and Pikmin 3, if Pikmin are carrying something, the music will change to a slightly more upbeat and cheerful variation. In Pikmin 2, this only happens if they're carrying a treasure, and if the player is near them, however. In Pikmin 2, Purple and White Pikmin will change to the size of a standard Pikmin when they are carrying something. In Pikmin 3, Pikmin that are blocked in all possible paths will idle with their load in a tight circle. Interestingly, touching the spoils with a leader will cause the Pikmin to pause for a few seconds before resuming their circling. With lighter objects, the leader can even push the Pikmin around as though on a low-friction surface, before the Pikmin return to their idling spot. In Hey! Pikmin, if a Pikmin is carrying a heart and gets stuck around an obstacle, and the Pikmin goes into an idle state before it returns the heart to Olimar (which could be caused by the Pikmin being separated for too long over too great a distance), then upon finding the Pikmin in its idle state, the heart it was carrying will be gone. Portuguese (NoE) Carregar Carrying Translation taken from the Pikmin instruction manual. ↑ YouTube video showing speed visibly slowing when the final grounded Pikmin to carry is added. This article was a featured article from December 25th, 2014 to March 1st, 2015. This page was last edited on April 18, 2019, at 17:16.